Yarn: Red Heart Super Saver Color 0320 Cornmeal, Mainstays Home (Walmart brand yarn) Color 2360 Baby Mint, and scrap black yarn. A low calorie treat. Well done. That cone looks so real! I say to hell with leaving well enough alone..that cone AND ice cream rocks! and mint chocolate chip too my favorite! Donna, it’s great! Yum yum! Donna, that is too adorable. It looks good enough to eat. Fabulous crochet! I’m impressed. 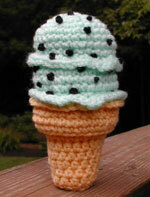 There is a Japanese website that has more crocheted food that you can even imagine, but no ice cream cones, I think. Congratulations on your clever ramping-up of the original design. Love your version of ice cream cone!If it is possible,I would like the pattern for it.It would be very much appreciated! love it love it ! ! ! Nice cone! I just might have to make one. I think it would make a good gift decoration. Your ice cream cone looks great!! I love your second scoop! My husband is an ice cream fanatic, maybe I should crochet him up one for his birthday this september LOL, I bet he’d love it. I love your “double dip” cone, and I like the cone itself so much better. Are you willing to share the pattern? Any chance you could email me your adorable ice cream cone pattern? Would this be easy for a “kinda” beginner?? Nice cone, you made me hungry. Love the double scoop on your ice cream cone pattern. Would you be willing to email the pattern?